AirTV is cooking up a grand unification of cable channels, broadcast TV, over-the-air DVR, and on-demand streaming—and it might have the ingredients to pull it off. Reality was more ambitious than rumor when AirTV made its big debut at CES 2017. Instead of a networked antenna tuner that feeds broadcast channels into the Sling TV app on other devices, AirTV wants to be the complete package. It’s a $100 Android-based box with an optional antenna hookup, letting you stream Sling TV channels and free over-the-air broadcasts into a unified interface, which also includes recommendations from Netflix. The remote control strives for similar harmony, with TV power and volume controls, dedicated guide and previous channel buttons, voice search from Google, and shortcuts to Netflix and Google Play Movies & TV. As importantly, AirTV isn’t just a product, but a new subsidiary of Dish Network, which also operates the Sling TV service. Its stated purpose is to ease the transition from traditional TV—that is, cable or satellite service—to online video. What we saw at CES is just the beginning. As someone who’s lived without cable TV for more than eight years, I’ve always relied on an antenna for content that streaming video lacks, including NFL games, awards shows, and the occasional prime-time broadcast. At the same time, I hesitate to recommend antennas to prospective cord-cutters who are less patient with technology, or who have little tolerance for change. Coming from cable, not everyone wants to constantly switch inputs or interfaces based on what they’re watching, or give up DVR and time-shifting for broadcast channels. AirTV solves the problem, at least partially, by offering one interface for free over-the-air channels and Sling TV’s streaming cable channels. 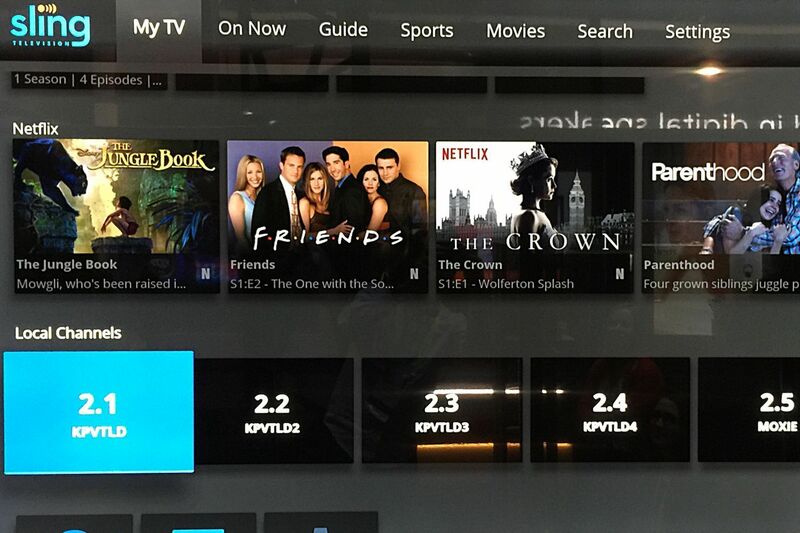 Live channels get a dedicated row on Sling TV’s home screen, and appear alongside cable channels in the Guide view. 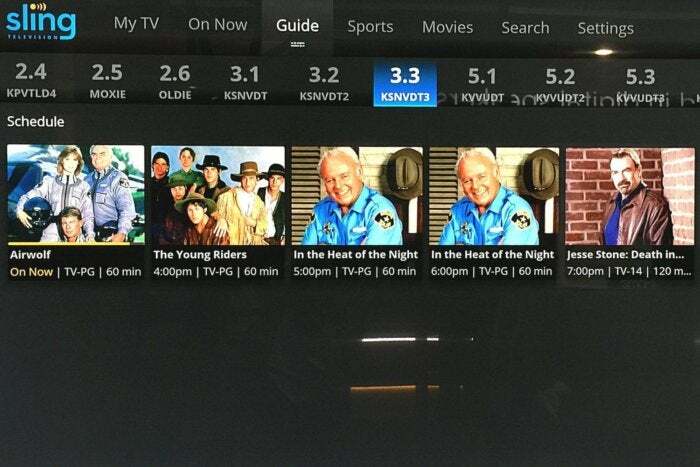 You can also flag favorite channels for quick access from Sling’s main menu. You just need to plug in the optional USB tuner ($130 as a bundle with the AirTV box, or $40 by itself) and hook up an antenna. AirTV’s modified Sling TV app lets you browse over-the-air channels alongside streaming cable ones. If that setup sounds like too much hassle, AirTV is piloting an installation program in 48 U.S. markets, using Dish’s existing base of technicians. An antenna is included in the service price, which is $99 for an indoor antenna or $149 for an outdoor antenna, says David London, AirTV’s head of product. As for DVR, London says that’s coming. 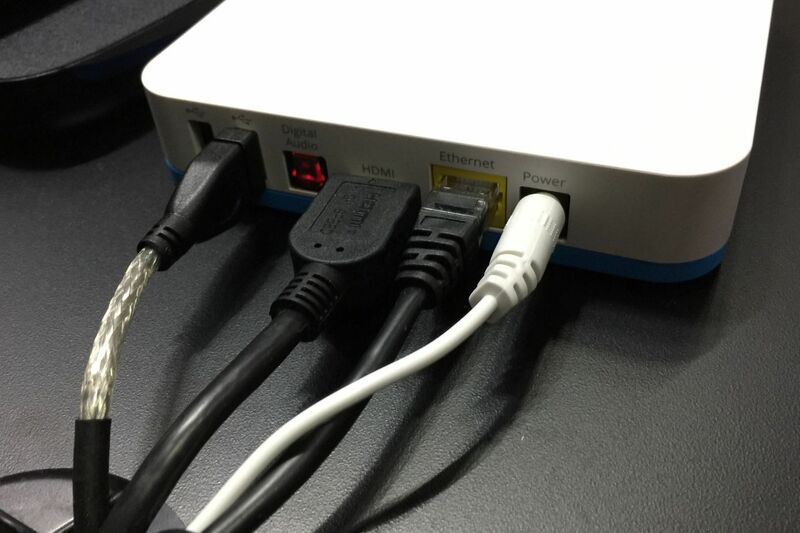 AirTV has two USB ports, so users will be able to hook up an external hard drive to store their recordings. AirTV might’ve been interesting enough as a combination of Sling TV and over-the-air channels, but the company also wants to build a unified launching point for streaming video services, starting with Netflix. AirTV’s version of the Sling app includes a row of Netflix recommendations and recently-watched programs, so users won’t always have to dig through multiple apps. Netflix gets its own row of recommendations within the Sling TV app. This sort of unified streaming guide has been the holy grail of device makers, including Apple, Amazon, and Roku. But Sling has taken a big first step by including the most popular streaming service—and one that’s notoriously protective of how its content appears. From here, you could easily imagine support for other streaming services inside Sling’s guide. London acknowledges that’s the plan, though the timeline is unclear. It’s worth noting that AirTV’s over-the-air and Netflix integration will work without a Sling TV subscription. 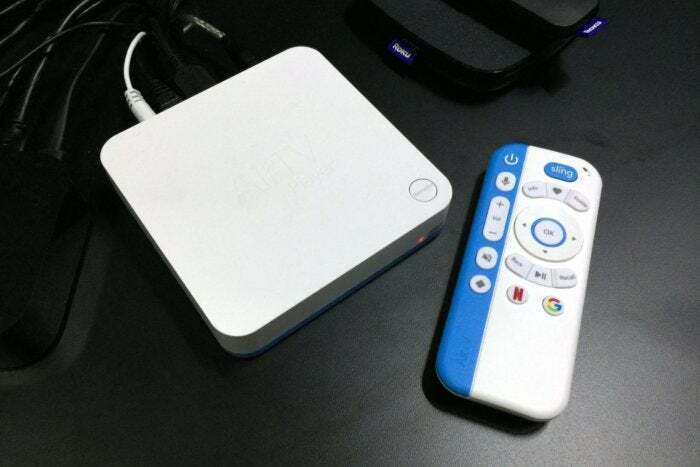 The AirTV Player is a full-blown Android TV, with access to many more streaming sources through the Google Play Store—even if they’re not integrated with the Sling guide. AirTV’s long-term plans are murky. The long-rumored networked tuner—which in theory would let users set up an antenna in a separate room from the TV— isn’t being planned, London says. Right now, AirTV just wants to see how the market responds to the USB tuner. The USB tuner remains a necessity for now, but there’s another open port that could someday support a DVR storage drive. Likewise, AirTV is not looking to release a streaming player with an integrated tuner, which would eliminate the need for a USB tuner dongle. An integrated tuner would have lengthened the time to market and raised costs, London notes. Cloud DVR for local channels is unlikely as well, London says, even though Sling is currently beta testing cloud-based recordings for streaming cable channels. Still, the goal will eventually be to have a unified interface for accessing all types of recordings. Even with the current hardware, AirTV will likely have plenty to work on between DVR, more streaming integrations, and the inevitable glitches that come with a version 1.0 product. Stay tuned for a full review of what’s working and not working out of the gate.